Activates EIF2AK2/PKR in the absence of double-stranded RNA (dsRNA), leading to phosphorylation of EIF2S1/EFI2-alpha and inhibition of translation and induction of apoptosis. Required for siRNA production by DICER1 and for subsequent siRNA-mediated post-transcriptional gene silencing. Does not seem to be required for processing of pre-miRNA to miRNA by DICER1. Promotes UBC9-p53/TP53 association and sumoylation and phosphorylation of p53/TP53 at 'Lys-386' at 'Ser-392' respectively and enhances its activity in a EIF2AK2/PKR-dependent manner (By similarity). Recommended sample types are human EDTA plasma and serum. A range of additional sample types are compatible with the technology (PEA), including citrate plasma, heparin plasma, cerebrospinal fluid, (CSF), tissue and cell lysates, fine needle biopsis, microdialysis fluid, cell culture media, dried blood spots, synovial fluid, saliva, plaque extract and microvesicles. 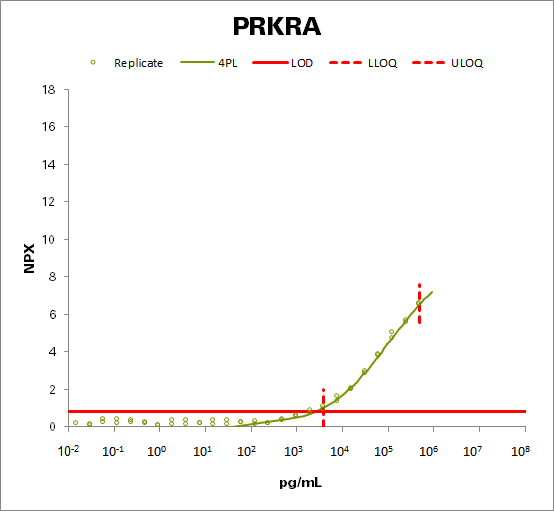 Please note that protein expression levels are expected to vary in different sample types. Certain assays are differentially affected by interfering substances such as hemolysate. Download any of our Data Validation documents or contact support@olink.com for more information. NOTE: The calibrator curve below shows the performance of the assay with the estimated sensitivity and dynamic range parameters indicated. These curves are generated during the assay validation process using recombinant antigens. Please note that when analyzing biological samples the data generated will be given in the form of relative quantification (NPX values) and cannot be converted to absolute protein concentrations. For more info about NPX measurements, please visit our FAQ page. Precision (repeatability) is calculated from linearized NPX values over LOD. Additional validation data, as well as a more detailed description of how the Olink panels are quality controlled can be found in our Data Validation documents. To download or to learn more go to the Data Validation page. Fill in the form and we will contact you as soon as we can.